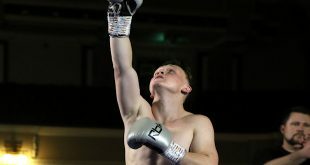 At Wolverhampton Civic Hall on Friday night, the action continued after the main British Middleweight title bout between Wayne Elcock and Darren McDermott. It turned out to be a very successful night for Errol Johnson and Bob Plant, with their fighters winning all of their contests! Mark Lloyd of Telford Walsall faced Nottingham boxer Andrew Alan Lowe, for the vacant British Midlands Area Welterweight title. ʽLloydy, Lloydyʼ the crowd cheered throughout the fight, which turned out to be a grueling slug-fest. An action-packed contest saw a relentless Lloyd wearing down his gritty opponent, who hadnʼt been past six rounds before. But a swinging right punch from Lloyd signaled the end for a brave Andrew Lowe, who - backed up to the ropes - suffered an onslaught from the Midlander. A punishing uppercut and a barrage of shots saw Lowe unable to escape and as the referee stepped in - the towel was thrown in by Loweʼs corner. 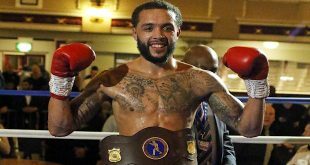 Mark Lloyd, the new Midlands Area Welterweight Champion, improves to 11 wins and 1 loss and later said his goal was to achieve a British title. Steven Haughian of Northern Ireland faced Spanish boxer Raul Saiz of Barcelona, in a four round welterweight contest. Haughian, under trainers John Breen and Eamonn Magee, got off to a good start . Saiz being quite open, the Irishman found his target easily. But at the start of round two, Haughian landed a good right punch which caused Saiz to wobble backwards to the corner. Haughian was quick to follow-up and subjected the Spaniard to a barrage of shots to head and body and Saiz was unable to throw any shots back. The referee called a stop to the contest which sees Haughian improve to 14 wins and 1 loss. Coventry boxer James Flinn faced the more experienced Paddy Pollock of Lanark, Scotland, in a four round welterweight contest. It was a fairly evenly matched fight, but Flinn was the busier of the two men and landed some quality punches. Flinn wins on points 39-38, adding a second win to his pro-record. Rob ʽYam Yamʼ Kenney faced Drew Campbell in a four round light middleweight contest. In the closing seconds of round one, Kenney lands a solid right punch to the face of Campbell, who drops to one knee and takes the count. Then, Kenney himself goes down in the opening seconds of round two after a right followed by a left from Campbell. Campbell is motivated by the knockdown and goes after Kenney. Itʼs a good round for Drew Campbell, but in the closing ten seconds of the frame, he wobbles off balance from a left hook delivered by Kenney. It was a messy last round which saw an accidental head-clash, causing a cut to the left brow of Campbell. Rob Kenney wins on points 40-36 and improves to 7 wins and no losses. Rob Hunt faced Alex Brew in a light welterweight contest. Despite being down on the canvas in the opening seconds of round one, Hunt survived the big round-house punches of his Ghanaian opponent to win on points. Huntʼs record stands at 10 wins and no losses. Steve Saville squared off against Baz Carey in a light welterweight contest in a crackin ʽbust-upʼ between these two ʽhard-knocksʼ! This was ʽBomberʼ Savilleʼs first fight back after a break of six years and having sent tough Baz Carey to the canvas in round two - successfully won on points. Keiron Gray went up against Tony Stones at middleweight and it was another ʽslug-festʼ between these two fighters. The power of ʽSlammerʼ Gray's punches could be clearly heard around ringside and he won all four rounds 40-36 adding his second win to his record. Lindsay Scragg met Galina Gumliiska at super feather and Scragg notched up her sixth win beating the experienced Bulgarian boxer 40-36 after four rounds. Gumliiska took a lot of punches from the Wednesbury woman in round three and looked the ʽsloppierʼ fighter. 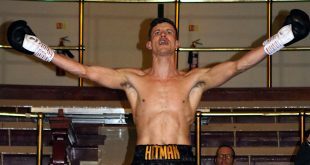 Russ Colley fought Ricky Strike at light middle and ʽRoosterʼ Colley scored his second win by out-pointing Rotherham's Strike. 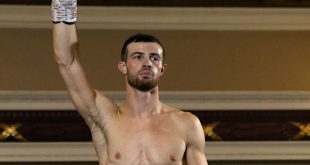 Middleweights Jamie Bull and Paul Royston went at it in Bull's pro debut and he spent much of the four rounds ʽchasingʼ his opponent around the ring to score a points win of 40-36 over Sheffieldʼs Royston.